The other day, I met a lady walking in the park. There was a spring in her step and her eyes were bright and sparkling. No, she wasn’t a 20 year old in love, but a grey-haired lady nearing 70. She was radiating so much energy and life that I wondered about youth - that passing shower that everyone craves to get soaked in for eternity. Time waits for no one and walks on relentlessly, yet there are ways to delay the physical ravages caused by old age, ways to imprison the spirit of youth and to keep it burning in our hearts. Our style of eating is one of the major factors that speed up ageing. The ageing process is due to the formation of free radicals in our body. They are by-products of our body’s metabolic process. Our body has its own mechanism to keep itself healthy. It has its own special defense force to counteract these radicals. They are called antioxidants and they prevent degeneration of body tissues. Our body reaches full maturity around the age of 25. By the time we reach 35 our body begins to gradually slow down its activities and the life processes also slow down. So to remain healthy and young, it is imperative that we make certain changes in our diet and eating habits. Antioxidants that counteract free radicals need to be included generously in our diet. Vitamin E is one of the best antioxidants that fights ageing. Vitamin E (1) being fat-soluble prevents free radical damage to lipids, including those that makeup cell membrane and traps free radicals attempting entry into the cell. With its limited capacity for containing trapped free radicals, vitamin E transfers them to vitamin C, which neutralizes the radicals. That’s why supplements that contain both vitamins provide better antioxidant protection than single vitamins. However supplement shave to be taken only under doctor’s supervision. It’s best to consume foods surplus in these vitamins instead of taking supplements, anyway. Vitamin E is found in abundance in almonds, spinach, sweet potatoes, avocado, wheat germ, sunflower seeds etc. While vitamin C rich foods include bell peppers / capsicum, leafy green vegetables, citrus fruits, kiwi fruit, broccoli, green peas, papaya etc. Some benefits of consuming vitamin E rich foods apparently balances cholesterol, repairs damaged skin, thickens hair, helps with PMS symptoms, improves vision, decreases risk of Alzheimer’s disease etc. Vitamin C (2) is used by the body in the maintenance of bones, muscles and blood vessels. It also assists in the formation of collagen and helps the body absorb iron. It also improves immunity and decreases the risk of cancer. Salads are healthy. Make them a part of your diet. Including salads in your diet is also a must. 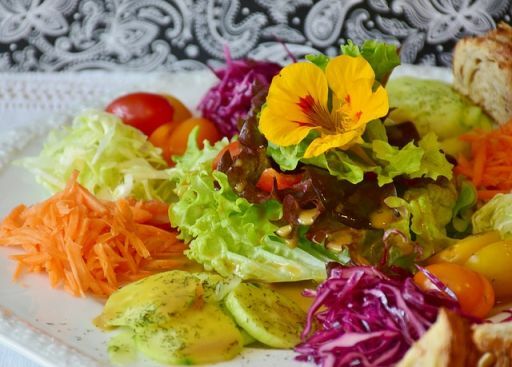 If you eat more of green salads, you will have higher blood levels of a host of powerful antioxidants like vitamin C, and E, folic acid, lycopene and alpha and beta carotene, and more so if your salad includes raw vegetables, according to WebMD (3). Vegetables in salads also a good source of insoluble fiber, which keep your digestive tract healthy. Cutting down of saturated fats, refined carbohydrates like soft bread and tempting pastries, more so, after the age of 30, helps to keep the body healthy. White flours like maida, white sugar etc should be avoided as much as possible. It’s best to eat food raw, boiled steamed or baked, rather than fried. A glass of warm water with 1-2 tsp lime / lemon juice early in the morning on an empty stomach helps stimulate the gastrointestinal tract and does wonders to your system. While many believe that lemon water might be acidic, this is simply not true. On the contrary, it has an alkalizing effect inside the body as it is low sugar and rich in alkaline minerals. Foods rich in minerals and proteins like soybean products, fish, lean meats like chicken and fruits are very good. One of the best alkalizing drinks is potato water. Wash 3 or 4 potatoes, dice and simmer in 2 glasses of water till it reduces to half the quantity. Strain and drink the water daily. Making small but healthy changes in our diet and eating style is the first step towards eternal youth. Nutritious food isn’t enough if you want to feel energetic and youthful in your later years; physical activity and exercise is also very essential. (Do read Can exercise make you younger?) The best way to keep fit is to walk our way to youth. Walking is one the best aerobic exercises. It costs you nothing but time. It is nature’s special anti-age tonic. After 20 centuries of medical research it has been confirmed that what Hippocrates – the Father of Medicine said was true. Walking is the best medicine. Walking is as natural to human beings as breathing. When we walk we use all the muscles in our bodies. It is the most efficient form of exercise and can be followed at any age. Researchers have found that the lungs of regular walkers exhibit less emphysema than those of people with sedentary lifestyles. Studies have found that physical inactivity causes chronic obstructive pulmonary disease or COPD. 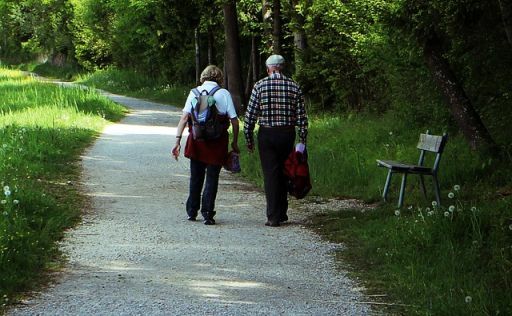 Walking has a striking effect on obesity besides slowing down the process of ageing considerably. A Stanford study, supports the universal ability of physical activity to stimulate creative thinking in groundbreaking ways. Oregon State University researchers have found that older adults who regularly performed light-intensity exercise were 18 percent healthier than their peers who were less active. These regularly active people had lower body mass index (BMI), smaller waist circumference, better insulin rates, and were less likely to have chronic diseases. Regular exercise is better for your hearing too. Read Exercise makes you hear better. How much should one walk and how fast? The distance we cover is as important as the pace. You can begin walking about 1-2 km at a moderate pace. After 6-8 weeks, your pace should be such that you are able to cover 3 km in an hour. Climb stairs as many times as possible. Try to walk rapidly in spurts during your long walking. By timing the number of steps taken per minute, you can approximately know your pace. An hour’s walk above your daily routine is enough to keep you trim and fit. Research has also found that it’s not just your heart and muscles that benefit from walking; your brain does too! The foot’s impact during walking apparently sends pressure waves through the arteries that significantly modify and can increase the supply of blood to the brain. Walking is one of the best exercises; it costs nothing but time. Walking or for that matter any form of exercise does not make you feel hungrier as many people believe. Research has shown otherwise. Do read the post Does exercise increase your hunger pangs? When we walk, the circulation of blood is thorough. Every cell receives enough nourishment and this keeps our body young. Do read Exercise your way to longevity. To remain young mentally is half the battle. The formula is simple. Concentrate on that part of the body which is still growing – your brain. The main problem is that different parts of our body begin to age or mature at different times. For instance,our eyes age much faster than the rest of our bodies. (Also read Exercise for better vision.) Our reproductive power, at least for women deteriorates after the age of 35 but the brain reaches its zenith only after 40 and keeps on growing till 60. Thereafter slow decay sets in. Learning is a lifelong process. There can be commas, but no full stop to learning. The most endearing quality of children is their curiosity to know and learn. This is the very essence of youth. My aunt who didn’t have the opportunity to study earlier, completed her graduation at the age of 50. Settling into a fixed routine is like ringing the death knell for youth. Deciding to explore new frontiers, to do what you always wanted to do but never found any time, is a sure-fire way to enjoy permanent youth. Read Hobbies add spice to life. Though memorizing power decreases, creativity does not. (Read Tips to beat memory lapses.) Calling frequently on the brain to think anew keeps it healthy and alert. There is no age limit to learning and enterprise. Mrs. Mehta, a neighbour of ours, conducts cooking classes and runs a crèche at the age of 60. When Mr. Mehta retired from the army, he settled in his own house which had some bare land. He learnt gardening the hard way, but now he is a successful florist and even exports flowers. Also gardening is a very health hobby for elderly people. It ensures strong bones too. Read the post Strengthen bones by gardening . Worrying is a catalyst to ageing besides being a time waster. The main cause of worry is having too much free time on hand and having negative approach to life. Do read Get rid of that worrying problem. and Fight Stress with leisure. Emotional immaturity does not mean youth. In fact, people who have not matured emotionally often pass into their second childhood quickly for they never ever got out of their first one completely. Do read How mature are you - Part 1, Part 2, Part 3 & Part 4. Mentally mature persons are more likely to remain young. They become tough by tackling problems all the time, by gaining experience and expertise and by becoming wiser and more active. To constantly learn something new, however trivial it may be, must be out motto. One must be like the grandmother who learnt to operate a laptop from her grandchildren and started communicating with her relatives all over the world. Daily sips of this elixir of youth promises to keep your body, mind and spirit eternally young. I made self-care a priority and incorporated small, gradual healthy changes into my everyday life.I eat well.I exercise.I drink at least 70 ounces of water a day. I manage stress I manage stress I sleep soundly.